CNN on Tuesday filed a lawsuit against President Donald Trump and top White House aides after they revoked White House correspondent Jim Acosta's press credentials last week. "This morning, CNN filed a lawsuit against @realDonaldTrump and top aides. 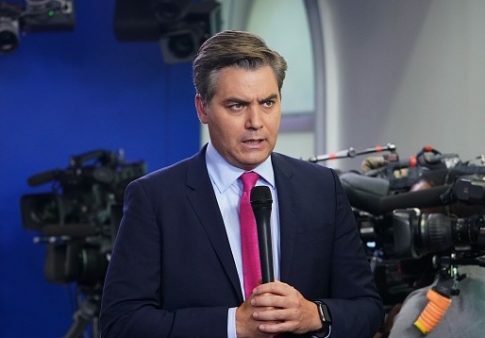 The White House has violated CNN and @Acosta's First Amendment rights of freedom of the press and Fifth Amendment rights to due process," CNN's communications team tweeted. CNN and Acosta are both plaintiffs in the lawsuit, and six defendants from he Trump administration are listed. The defendants are Trump, chief of staff John Kelly, press secretary Sarah Huckabee Sanders, deputy chief of staff for communications Bill Shine, the director of the Secret Service, and the Secret Service officer who revoked Acosta's hard pass last Wednesday. The White House acknowledged in a statement on Tuesday it had been advised of the complaint, which it referred to as "just more grandstanding from CNN," and said the administration would "vigorously defend against this lawsuit." The press secretary said Acosta's inappropriate and unprofessional behavior could not be tolerated in the interest of running an "orderly and fair press conference." The White House cannot run an orderly and fair press conference when a reporter acts this way, which is neither appropriate nor professional. The First Amendment is not served when a single reporter, of more than 150 present, attempts to monopolize the floor. If there is no check on this type of behavior it impedes the ability of the President, the White House staff, and members of the media to conduct business. Following the suspension of Acosta's credentials, reporters asked Trump about the CNN correspondent, prompting the president to castigate him as "a rude, terrible person." "I think Jim Acosta is a very unprofessional man. He does this with everybody. He gets paid to do that," Trump said. "Whether it was me or Ronald Reagan or anybody else, he would have done the same thing." "I don't think he's a smart person, but he's got a loud voice," Trump added. Ted Olson, an attorney for CNN and Acosta, said the correspondent's press credentials "must be restored so that all members of the press know they will remain free to ask tough questions, challenge government officials, and report the business of the nation to American people." This entry was posted in Politics and tagged CNN, Donald Trump, Jim Acosta, Sarah Sanders, White House. Bookmark the permalink.